Imagine being married at twelve and widowed at fifteen or being widowed twice by the time you were twenty-five! Such were the first years of our two blesseds, Nuns of the Order of the Preachers whose feast we celebrate on April 17th. Both our beatae came under the holy influence of St. Catherine of Siena and eventually entered the Dominican Monastery of the Holy Cross in Pisa, Italy. In 1535, both founded the monastery of Saint Dominic renewing regular observance. After the death of her husband, Clara entered the local Poor Clare monastery. Her brothers found out and took matters into their own hands. They forcibly removed her from the monastery and kept her locked in her room. 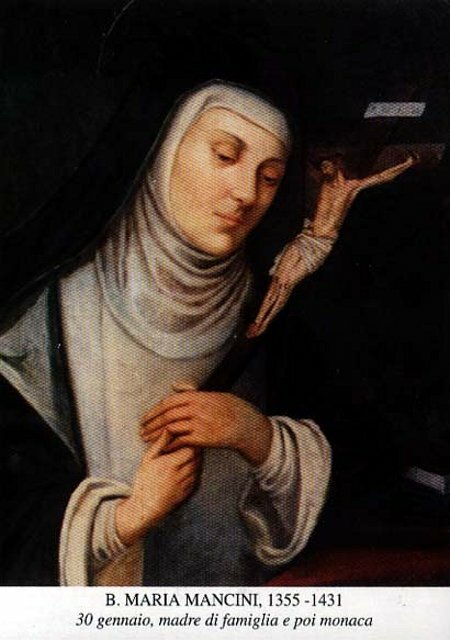 For five months she was unable to leave or see anybody but then finally on the feast of St. Dominic her mother got her out and she went to Mass and shortly thereafter entered monastic life again, this time the Dominican Monastery of the Holy Cross. Blessed Clara was known for her prudence and charity and even forgave the assassin who murdered her father and brothers and even welcomed his widow as a nun into the monastery. She held study in high regard and urged her Sisters to be faithful to this observance. Blessed Clara died in 1419 and upon her death Blessed Maria became prioress. Blessed Maria died in 1431.